In all cultures, human hair and hairdo have been a powerful metaphor. Tracing back the importance and significance of human hair to the dawn of civilization on the Indian subcontinent, we find that all the Vedic gods are depicted as having uncut hair in mythological stories as well as in legendary pictures. The same is true of the Hindu avatars, and the epic heroes of the Ramayana, and the Mahabharata. Finally, there are a number of hair peculiarities in India pertinent to the creed and religious practices of the Hindu, the Jain, and the Sikh. Shiva Nataraja is a depiction of the Hindu God Shiva as the cosmic dancer who performs his divine dance as creator, preserver, and destroyer of the universe and conveys the Indian conception of the never-ending cycle of time. The same principle manifests in the hair cycle, in which perpetual cycles of growth, regression, and resting underly the growth and shedding of hair. Finally, The Hair Research Society of India was founded as a nonprofit organisation dedicated to research and education in the science of hair. 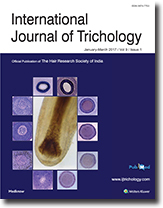 Notably, the HRSI reached milestones in the journey of academic pursuit with the launch of the International Journal of Trichology, and with the establishment of the Hair India conference. Ultimately, the society aims at saving the public from being taken for a ride by quackery, and at creating the awareness that the science of hair represents a subspecialty of Dermatology. In analogy again, the dwarf on which the Nataraja dances represents the demon of egotism, and thus symbolizes Shiva's, respectively, the HRSI's victory over ignorance. Background: Hirsutism is the presence of terminal hair in females in males pattern. It occurs in 5%–15% of women. Modified Ferriman–Gallwey (mFG) score of ≥ 8 is considered hirsutism, but there are populations with a low mFG score. In clinical practice, hirsutism is subjective. Although hirsutism is considered as a purely esthetic problem, it is associated with many underlying disorders, especially androgen excess disorders. Polycystic ovarian syndrome (PCOS) disease is the most common cause of androgen excess in females, and there are reports of its association with metabolic syndrome. Metabolic syndrome occurs alone in hirsutism. Aims: To assess mFG score in patients who consider themselves as hirsute. To study the association between metabolic syndrome and hirsutism. Methods: Hospital-based cross-sectional study design was adopted. A structured questionnaire was used to collect sociodemographic and clinical data. The severity of hirsutism was assessed using mFG score and metabolic syndrome was diagnosed by the American Heart Association criteria. mFG score was expressed as mean and Student's t-test and Chi-square statistic were used as the tests of significance. Logistic regression analysis was performed. Results: The mean mFG score was 5.5. Metabolic syndrome was present in 44%. About 65.2% of patients with score ≥8 had metabolic syndrome, whereas only 37.7% of patients with score <8 had metabolic syndrome (P = 0.019). Metabolic syndrome (P = 0.018) and PCOS (P = 0.003) were the significant variables in logistic regression analysis. Triglyceride levels ≥150 mg/dl and waist circumference ≥88 cm were the components of metabolic syndrome that were significantly associated with hirsutism (P = 0.006 in both). Conclusions: To find the ideal cutoff of mFG score to define hirsutism in our population, a population study among females in the reproductive age group has to be conducted. As there is a definite association of hirsutism and metabolic syndrome, and metabolic syndrome can result in cardiovascular complications, any women presenting with terminal hair in a male pattern should be evaluated for metabolic syndrome irrespective of the mFG score. Background: Premature canities is a common yet unfathomed disorder. 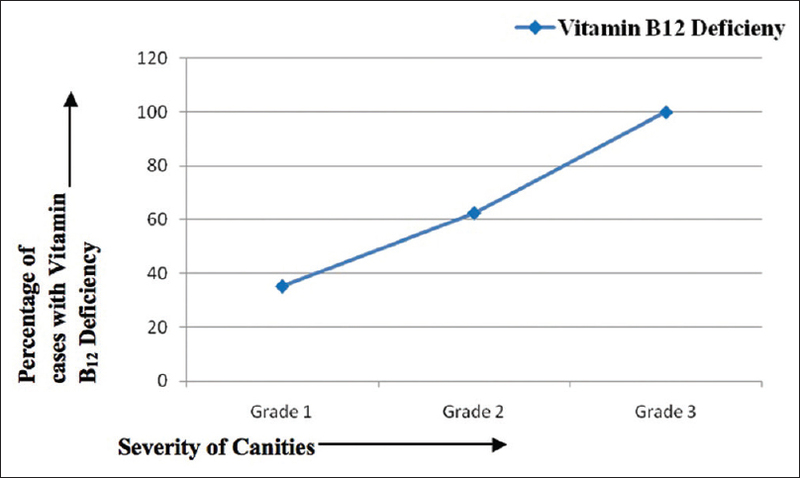 The evidence for the role of micronutrient deficiency in premature canities is not well established. Aim: The present study was undertaken to evaluate the micronutrient levels in Indian patients with premature canities as compared to controls. Materials and Methods: We conducted a case–control study in 52 self-reporting patients with premature canities (<20 years age). Micronutrient levels including serum Vitamin B12, biotin, and folic acid were assessed and compared among the patients and controls. Results: We observed that mean serum Vitamin B12 (198.07 ± 88.98 pg/ml in cases vs. 343.07 ± 143.06 pg/ml in controls, P = 0.000), folic acid (6.22 ± 2.46 ng/ml in cases vs. 8.49 ± 4.18 ng/ml in controls, P = 0.01), and biotin (252.71 ± 18.79 pg/ml in cases vs. 266.47 ± 30.44 pg/ml in controls, P = 0.013) levels were significantly lower in cases as compared to the controls. Conclusion: In view of the dark hair and many prevailing myths, premature canities is a significant problem in Asians with profound psychosocial impact. This study unveils the association with Vitamin B12, folic acid, and biotin deficiencies. Larger studies are recommended to arrive on a logical conclusion. 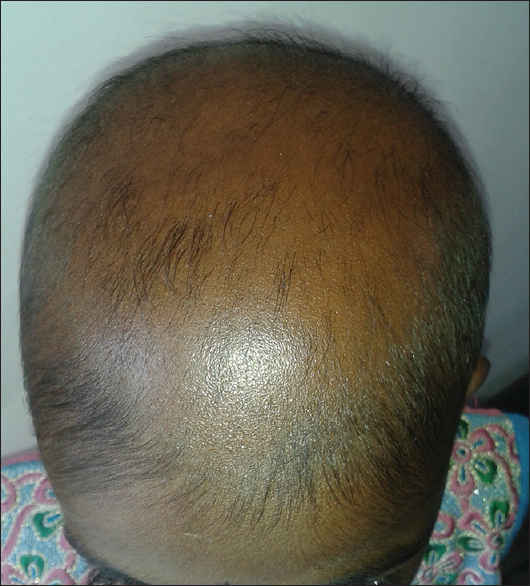 Background: Telogen effluvium (TE) is a type of acquired, diffuse alopecia that occurs due to an abnormal shift of scalp hair follicles from anagen to telogen, leading to premature shedding of hair. Previous studies have suggested the existence of a neuroimmunologic “brain-hair follicle” axis, in which mast cells have been implicated as an important link between the nervous system and immunologic system. Objective: The current study sought to investigate the role of mast cell presence and mast cell degranulation in the pathogenesis of TE. 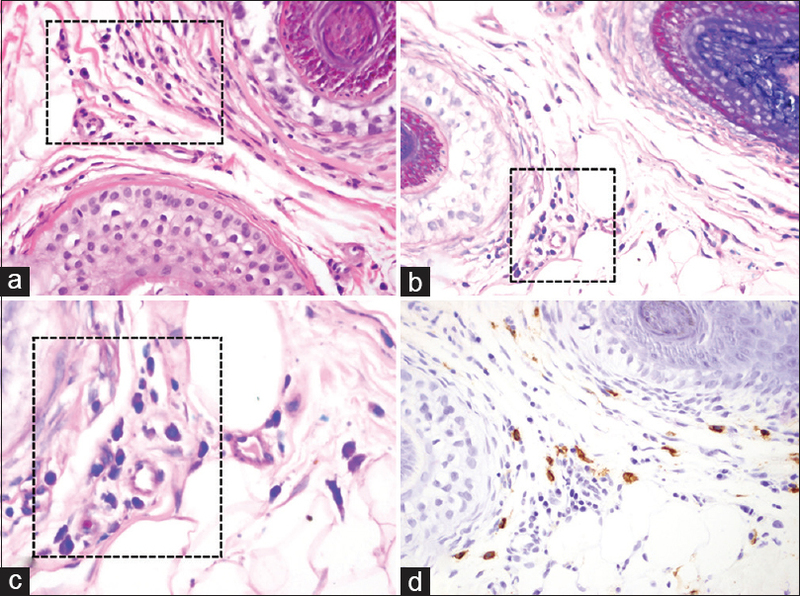 Materials and Methods: Mast cells were counted using Giemsa and tryptase immunohistochemical stains in scalp biopsy specimens with the pathologic diagnosis of TE (TE, n = 10), alopecia areata (AA, n = 7), and androgenic alopecia (ANDRO, n = 9). Results: We found significant (P < 0.001) group-level differences between the mean mast cell counts per high-power fields for each type of alopecia studied. Tukey post hoc analysis showed the mean mast cell count for TE to be significantly larger than AA for both Giemsa (P = 0.002) and tryptase (P = 0.006); significantly larger than ANDRO for both Giemsa (P < 0.001) and tryptase (P < 0.001); and significantly larger when compared to normal scalp skin for both Giemsa (P < 0.001) and tryptase (P < 0.001). No significant difference of mean mast cell counts was observed for AA compared to ANDRO for Giemsa (P = 0.373) or tryptase (P = 0.598) stains. Conclusion: Our findings suggest that mast cells could play a role in mediating stress-induced hair loss seen in TE. Thallium is a toxic heavy metal often involved in criminal poisonings and occasionally in accidental poisoning. Here, we report a case of acute, nonintentional thallium poisoning due to thallium-contaminated alternative medicine for its rarity and to create awareness about the combination of rapid, diffuse alopecia with neurologic and gastrointestinal symptoms among practitioners, professionals, public, and policymakers. Membranous, bullous, or cystic aplasia cutis congenita is a clinical subtype of aplasia cutis, covered with a membranous or glistening surface. 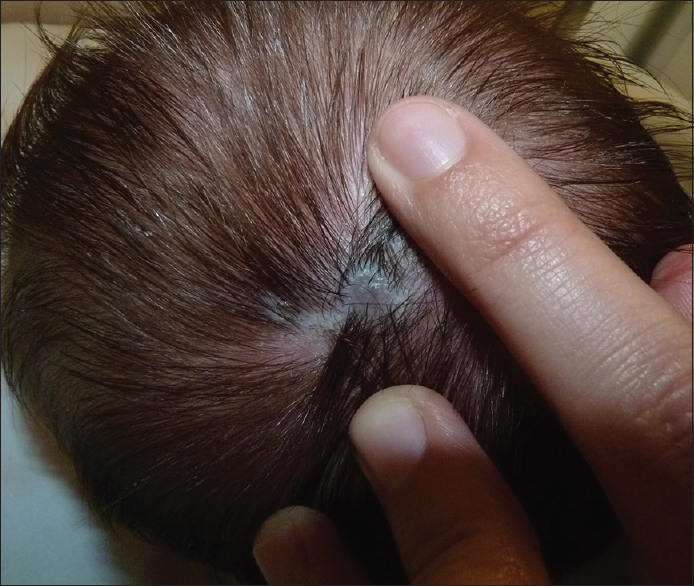 A male newborn presented at birth with two flat lesions on the left parietal scalp, surrounded by a rim of terminal hairs. Physical examination revealed two translucent papules. On dermoscopy, they showed a reddish background, thin, lineal vessels and, remarkably few hair bulbs could be seen because of the translucency of the lesion. No skull bone and brain defects were found. The diagnosis of membranous aplasia cutis congenita was established. Histologically, it is characterized by an atrophic epidermis with loose fibrovascular stroma and edematous dermal stroma. Dermoscopy may help to rule out other entities (herpes simplex, epidermolysis bullosa, trauma…) since the atrophic epidermis and fibrovascular stroma is evidenced by the hair bulbs and its characteristic translucency (“translucency's sign”). 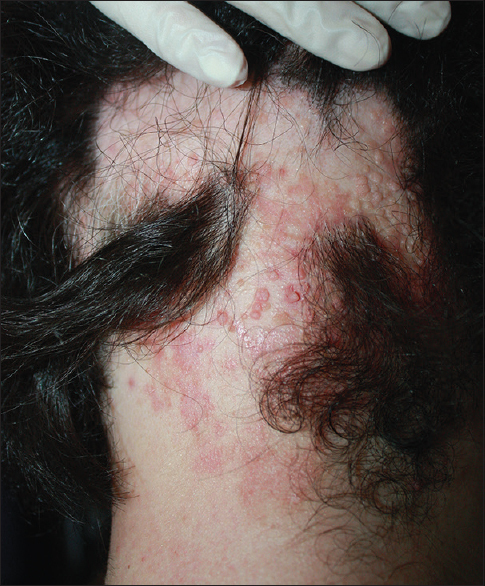 Alopecia areata is an autoimmune skin disease which is usually characterized by patchy hair loss in effected regions. Diagnosis usually based on clinical findings and main treatment options include topical, intralesional, systemic corticosteroids, and topical immunotherapy. Verruca vulgaris is an infectious disease caused by human papillomavirus which is usually characterized by well-marginated hyperkeratotic papules or plaques. There are several treatment modalities such as physical and chemical destruction and topical immunotherapy. A 23-year-old male patient presented to our outpatient clinic with multifocal noncicatrial alopecic plaques on scalp and multiple periungual verrucous papules on bilateral hands. 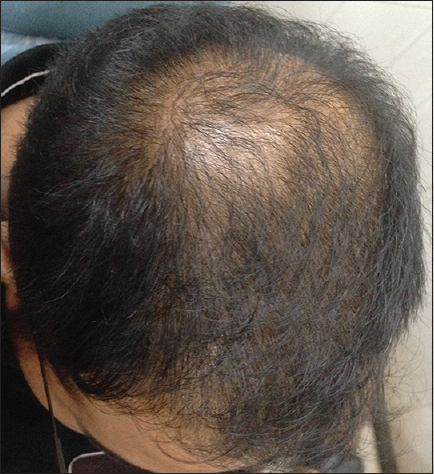 High potent corticosteroid cream and minoxidil lotion 5% were offered for his scalp lesions, and topical 5-fluorouracil lotion was initiated for his verrucous lesions. In the 1st month visit, we detected contamination of viral warts on alopecic plaques of his scalp and all the previous therapeutics were stopped. We initiated topical diphenylcyclopropenone (DPCP) sensitization weekly. After the fourth application of DPCP, we observed that all of hyperkeratotic papules disappeared. Diphencyprone treatment was continued, and with further applications, hair growth as vellus type was observed. DPCP is relatively beneficial treatment option for both diseases although it is not a first-line therapy most times. There are case reports and series about this treatment for both of these diseases. 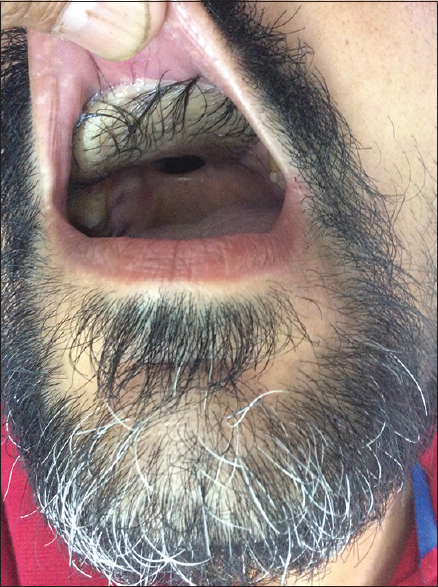 We want to present this case to by regard of the unusual presentation and efficacy of DPCP in both indications. Gray hair syndromes are rare syndromes which have an autosomal recessive inheritance and are characterized by pigmentary dilution of skin and hair, defects in immunological function, and nervous system defects. They comprise three disorders namely Chediak–Higashi syndrome (CHS), Griscelli syndrome (GPS), and Elejalde syndrome. Clinically, it is difficult to distinguish these disorders as their clinical features may overlap. Hence, to make a correct diagnosis and differentiate between CHS and GPS light microscopic examination of skin and hair shafts as well as peripheral blood smear evaluations should be done. In cases where the diagnosis is not possible chromosomal analysis for specific mutations can be done. In resource-poor settings where chromosomal analysis is not possible, and light microscopy findings are inconclusive, polarized microscopy can serve as a useful tool to distinguish between CHS and GPS. We report three cases with gray hair syndromes where the diagnosis on light microscopy and polarized microscopy of hair shaft correlated with the bone marrow examination findings and chromosomal analysis, thus emphasizing the importance of a noninvasive, cost-effective, and time-saving alternative in the diagnosis of these syndromes.